Domaine de la Solitude has one of the longest histories in the Rhone Valley. The Barberini family who founded the estate can trace their roots in Chateauneuf du Pape back to the 1604. Before that, the family was well known in their native land of Italy. They were quite an established, or should I say famous family as far back as the 13th century. In fact, Maffeo Barberini became the Pope, using the name of Urbain VIII. Two of the nephews of Maffeo Barberini became Cardinals and moved to Avignon. Perhaps that move was due to issues related to loud accusations about destroying historic monuments so the materials could be used to create, new, palatial estates and palaces for their personal use. But what is important for us is, that move to Avignon led the family to a career making wine in Chateauneuf du Pape! From there, through marriage and a dowry, what we know of today as Domaine de la Solitude was born. The estate took its name from the La Solitude lieu-dit, which is where much of their vineyards are planted. Domaine de la Solitude was one of the larger vineyards in the region by the mid to late 1800’s. At the time, the wine was produced and sold under the name of Vin de la Solitude. It took a few hundred years, but by 1900, the Southern Rhone Valley estate had become so popular, they began to produce, sell and bottle their own wine. The modern era for Domaine de la Solitude began in the 1970’s when a direct descendant through marriage, Pierre Lancon began managing the estate. That tradition continues today, as the estate is managed today by his children, Michel Lancon and Jean Lancon. Domaine de la Solitude owns 35 hectares of vines in Chateauneuf du Pape. 30 hectares are devoted to the production of red wine and 5 hectares are used for growing grapes used to make their white Chateauneuf du Pape wine. All 35 hectares are located in the La Solitude lieu dit, which is next to La Crau. The vines are planted in a terroir of sand, loam, clay and rocky soils. Domaine de la Solitude has old vines. In fact, their oldest parcel of Grenache vines are more than 100 years old. In 1985, Domaine de la Solitude made changes in their approach to wine making. They replaced their old foudres with concrete vats and stainless steel tanks. In 1996, they renovated their winemaking facilities again and began experimenting with using some new, French oak barrels as well for the aging process. In 1999, Domaine de la Solitude expanded their output, launching new labels. Cuvee Barberini made its debut in 1999 and the Reserve Secret was launched with the 2000 vintage. To produce the wine of Domaine de la Solitude, the grapes are partially destemmed. Vinification takes place in 150 hectoliter vats. 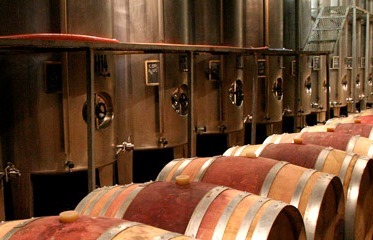 Malolactic fermentation occurs in French oak barrels. The parcels and grape varieties are each vinified separately. Depending on the grape, Domaine de la Solitude will ferment in concrete vats, stainless steel tanks or resin vats. On average, up to 10% of the wines can be aged in a portion of new, French oak barrels. The best vintages of Domaine de la Solitude are: 2016, 2015, 2012, 2010, 2009, 2007, 2005, 2001 and 2000. Domaine de la Solitude produces 4 red Chateauneuf du Pape wines and 2 Chateauneuf du Pape Blanc wines. Domaine de la Solitude Chateauneuf du Pape – From a blend of 55% Grenache, 25% Syrah, 15% Mourvedre and 5% Cinsault. The wine is aged in tank and a combination of new and used French oak barrels for 16 months. Production is close to 8,500 cases per year. Domaine de la Solitude Reserve Secrete – The blend for this wine varies, depending on the vintage, on average, it’s 50% Grenache and 50% Syrah. However, in some vintages, Mourvedre is also used as part of the blend. The wine made its debut with the 2000 vintage. The terroir is pure sandy soil with vines planted in the La Crau and Blachières lieux-dits. The wine is aged in a combination of new French oak barrels that range from 30% to 60% of the wine, while the remainder of the production is aged in foudre and tank for about 16 months. Only 250 cases are made each year. Domaine de la Solitude Cuvee Barberini – The wine was first made in the 1999 vintage. The name of the wine is a tribute to the original founders of the estate, the Barberini family. The wine is made by blending 45% Grenache and 45% Syrah with 10% Mourvedre, although that can vary widely. The wine comes from a terroir of rock and stone soils. 30% of the wine is aged in new, French oak barrels. The remainder of the wine is aged in tank for 18 months. The total production is close to 250 cases per year. Domaine de la Solitude Cuvee Cornelia Constanza made its debut in 2005. The name of the wine was chosen to honor an ancestor of the family, Cornelia Constanza Barberini. The wine is produced from 100% old vine Grenache. The vines are in a terroir of 100% sandy soil in the La Crau vineyard. The vines used for this wine are all more than 80 years of age. For the aging of the wine, 30% of the wine is aged in new, French oak barrels and the remainder is aged in vat and foudre for about 15 months. The production is on average 250 cases per vintage. Domaine de la Solitude Chateauneuf du Pape Blanc is made from 30% Grenache Blanc, 30% Clairette, 25% Roussanne and 15% Bourboulenc. Production is close to 900 cases per year. Domaine de la Solitude Cuvee Barberini Blanc – 80% Roussanne and 20% Clairette. On average the production is close to 250 cases per year. Domaine de la Solitude can be enjoyed on the young side. Young vintages can be popped and poured, or decanted for between 1-2 hours allowing the wine to soften and open its perfume. Older vintages might need very little decanting, just enough to remove the sediment. Domaine de la Solitude is usually better with 3-5 years of bottle age. Of course that can vary slightly, depending on the vintage. In the best vintages the wine should be consumed within 4-15 years after the vintage. Domaine de la Solitude is best served at 15.5 degrees Celsius, 60 degrees Fahrenheit. The cool, almost cellar temperature gives the wine more freshness and lift. Domaine de la Solitude is best served with all types of classic meat dishes, veal, pork, beef, lamb, duck, game, roast chicken, roasted, braised, stewed dishes, sausage, barbecue and cassoulet. Domaine de la Solitude is also good with Asian dishes, hearty fish courses like tuna, mushrooms, cheese, pasta, eggplant and tomatoes. The white wine of Domaine de la Solitude is best served with a myriad of different seafood dishes, shellfish, crab, lobster, sushi, sashimi, chicken, pork and veal, as well as Asian cuisine. Domaine de la Solitude also owns 65 hectares of vineyards in the Cotes du Rhone appellation where they produce red, white and rose’ wine. Medium bodied, elegant, soft, silky polished and fresh, the fruit is ripe, there is a refinement and purity here. With its abundance of sweet, ripe, cherries, this is already just great to taste today. Full bodied, silky, luscious, fat, rich textures and red berries galore are impossible to ignore. The wine builds and leaves you with sweet, polished fruits and herbs, with the perfect, peppery hint, that just keeps on going. With a smoky, floral start, the wine moves to the sweet, lush cherry side, which is just what hits the spot. Round and polished in texture, this just feels and tastes great. Forward, with light, sweet, fresh red berries to start, the earth and herb notes add a lot here. Drink this baby young for all its sweetness and up-front, sweet, juicy kirsch. Medium bodied, elegant, fresh, kirsch and juicy, spicy red, silky fruits are all over the place. Forward in style, this is already open and delivering its pleasures. Light, fresh, forward, silky, open, and dominated by all the sweet kirsch that fills the wine in the nose and on the palate, this will be best tasted on the young side. It is not a wine for long term aging. Long, fresh, spicy, ripe and sensuous, with depth a flavor on the long finish. Slightly modern in style, but I liked it. Garrigue and kirsch pop with little effort. This is made even better with the supple textured, peppery cherries in the finish. After the initial blast of vanilla and coffee in the nose, the wine moves to licorice, jammy berries, earth, herbs and spice. Silky, elegant and supple on the showy palate, this is an outstanding, modern styled Chateauneuf du Pape. Rich, fat jammy berries with lush textures end with a sweet, tasty, mouthful of juicy, ripe, black cherry liqueur. This modern styled wine is already showing great. Rich, concentrated, fleshy and deep, the wine is full bodied, with polished tannins and rich textures. On the palate, there is depth of flavor, finishing with a melange of dark red fruits, spice, earth and licorice. The wine was made from blending 65% old vine Grenache with 35% Syrah. Round, lush, concentrated, ripe and delicious, the black raspberry, kirsch, thyme, earth and spicy personalty really shine. Produced from 100% old vine Grenache, the finish feels great and leaves you with a lasting impression of ripe red berries. Fully-mature, this blend of about equal parts Grenache and Syrah offers, spicy, thyme infused, red fruits, licorice and kirsch all the way through. Still holding on to its intensity, the wine is rich, but not flashy.